Cops and soldiers may soon be able to pull out their iPhones to track the eyes, facial features, voice and fingerprints of suspected criminals and combatants. The California-based company AOptix rolled out a new hardware and app package that transforms an iPhone into a mobile biometric reader. As first reported by Danger Room in February, AOptix is the recipient of a $3 million research contract from the Pentagon for its on-the-go biometrics technology. Opting for what it considers ease of use, the company decided to build its latest biometrics package, which it calls Stratus, atop an iPhone. A peripheral covering wraps around the phone — it’s an inch and a half thick, three inches wide and six inches tall — while the AOptix Stratus app presents a user interface familiar to any iOS user. Except you’re not going to be recording Vine videos, you’re going to be recording the most unique physical features of another human being. 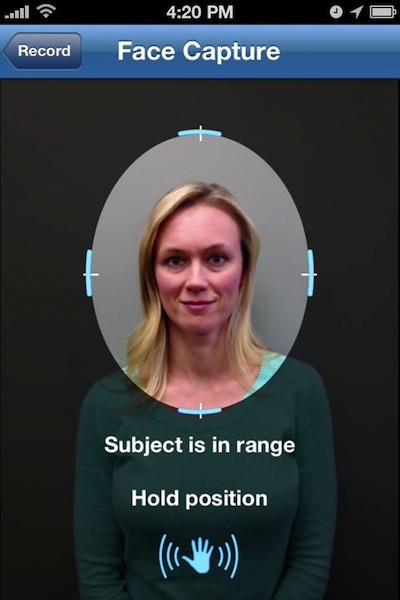 Here’s a look at the user interface on the AOptix Stratus iPhone app for when you’re trying to scan someone’s face. Image: AOptix. The Stratus system is designed to be a “single-handed” device, Pritikin explains. Load the app and tap for iris scanning or facial recognition. The imaging display, readable from about 11 inches distant and using nothing more than the iPhone’s camera, will automatically focus and snap the shot. The phone’s ambient microphone handles voice recording, but fingerprint scanning comes from the back of the Stratus peripheral wraparound, not the iPhone’s touchscreen. Unlike a similar product from Tactivo, there’s no smartcard reader, but it scans more biometric data than someone’s fingerprint. Anyone who’s ever used an iPhone will also be familiar with the Stratus app’s user experience for typing in annotations to the biometrics collected: small fields that look like any other iOS text feature allow quick notations. Standard iPhone geo-tagging is easy to enable, as a demo walkthrough AOptix showed Danger Room demonstrated. SMTP email functions transmit the biometric information back to a customer’s database. And an open architecture allows Stratus customers to develop their own add-ons. But Stratus “is not a 99-cent application,” clarifies Amanda North, AOptix’s marketing vice president. The app sells for $199, and the company isn’t disclosing how much its peripheral costs. While conceivably any individual who wants to drop that much money can rig his or her iPhone for biometric collection can, “it’s not a consumer application,” North says. It’s also not designed for every iPhone: AOptix built Stratus for the iPhone 4 and 4S, citing what it says was customer request. It doesn’t work with the iPhone 5, and the company isn’t saying what its plans are for future iPhone upgrades. The company may not intend Stratus to be a standard consumer product. And its expensive app and hardware may dissuade the average iPhone user from operating a biometrics collection suite from his or her pocket. But the Stratus is just the latest example of how sensitive biometrics data is increasingly collectable through readily available commercial devices.